"We already knew what the news was," Hester said. "Just hearing it from him. The media, the false fans, you all got what you all wanted. Majority of you all wanted him out. As players, we wanted him in. I guess the false fans outruled us. I thought he was a great coach, probably one of the best coaches I have ever been around. He brought me in." "I don't even know if I want to play again, man," Hester said. "You know, that's been on my mind for two years now. "It's not (as much fun anymore). It ain't. So, I have my workers' comp papers in my pocket. See how I feel, go home and talk to my wife, my family. See where we go from there. I've got two beautiful kids, man, young. Two boys. A lot of stress has been on my mind lately." 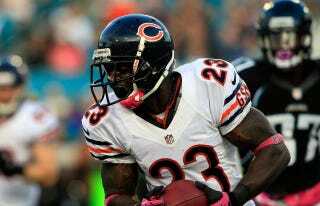 If Hester really does hang up his cleats, it would be a big loss for the Bears. Although Hester didn't take a punt or kickoff for six this season, he still averaged 25.9 yards per return on kickoffs. That's great field position for first downs, although not as good on second down, after Jay Cutler's been clotheslined for a seven-yard loss.